TORONTO — Mike Babcock mused about potential line combinations moments after the Maple Leafs signed star centre John Tavares in free agency on July 1. Toronto's head coach will finally put the plan he envisioned into action Thursday against the Detroit Red Wings. 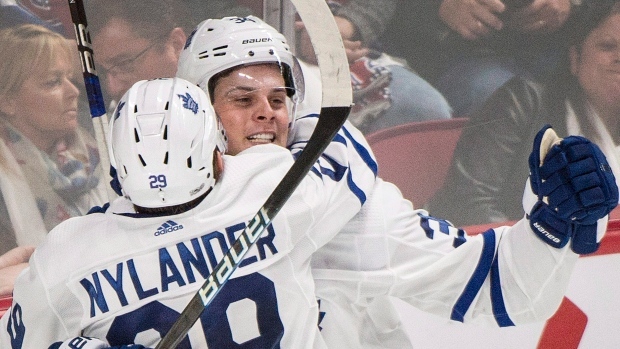 William Nylander, who ended his contract impasse by signing a six-year deal with the Leafs over the weekend, will make his season debut on a line with centre Auston Matthews and fellow winger Patrick Marleau. Tavares, meanwhile, is set to take up his usual spot between Mitch Marner and Zach Hyman to give Toronto a potent top-6 forward group. A restricted free agent until he signed just before Saturday's 5 p.m. ET deadline, Nylander should also add even more punch to the Leafs' third-ranked power play with the second unit. "He's just got to keep his shifts short, he's got to be detailed and work — everything else is a bonus," Babcock said following the morning skate. "It's going to take him some time, there's no question about it. "If it's not working we've got lots of guys to move around and go with different options, but that's where we'd like him to start." Nylander, who skated Tuesday and Wednesday on his own, has yet to take part in a full practice with his teammates. Thursday's brief morning skate was his first appearance on the ice at Scotiabank Arena. "It's been fun watching them play, but you want to be there as well," said the 22-year-old. "I'm excited to start on home ice and get the season going." Nylander is coming off back-to-back 61-point campaigns and is yet another weapon for a team sitting second in the NHL's overall standings heading into Thursday's action. Babcock said he doesn't expect it to take Nylander long to find his legs. "He's an intelligent player," said the coach. "Once he gets up to speed he'll be real good. We expect him to have energy tonight. "He should be the freshest guy in hockey." "It's his first game of the year, no pre-season, no anything," added Matthews, who played on a line with Nylander the last two seasons. "There's going to be that rust there, but knowing him I think it's not going to take him too long to get back and feeling comfortable." Toronto's 20-8-0 record is even more impressive when taking into account the club has done it without Nylander for 26 games — plus the two since he signed — while Matthews missed 14 with a shoulder injury. Marner sits fourth in the league with 39 points, Morgan Rielly ranks second for defenceman with 30, Tavares is tied for ninth in goals with 17, and Matthews has found the back of the net 15 times in the 14 games he's played. "That's just the depth and also the approach from the group and the guys — just staying focused on the way we need to play to have success," Tavares said of the Leafs' excelling minus two big pieces. "It's a great opportunity for everyone to be able to make a bigger impact." No. 1 goalie Frederik Andersen gets the night off after facing 40 shots or more in his last four starts as part of Toronto's six-game winning streak. Garret Sparks gets the call against Detroit with the Leafs set to open a five-game road trip Saturday in Boston. But all eyes Thursday will be on Nylander's return. "It's not like he just came out of the blue," Babcock said. "We know him pretty good and he's been with us. We're just going to put him in. No different than when you add an injured player. It's not like trading for a guy or anything like that. It's a guy that's been here, he understands, knows what's going on, fits in good in the room. "We've got lots of good players. We've got to figure out how to give them all ice time and look after them the right way so they're all important."